First things first. 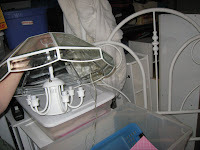 You have to have an ulgy old lamp to fix. Save the wire nuts when you remove them. It is a pain to find out you lost that little yellow screw on thing (nut). I untwisted the wires that were connected. I actually drew a picture of what wires went to which part, a little diagram, so I would get it right. A picture is worth a thousand words, but a diagram has a few very helpful words just where you need them. 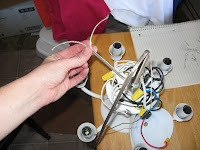 I had to pull the old wire out of the lamp. I mean PULL! 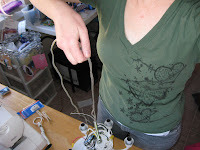 Then I had to thread the new wire through the opposite way I took the old wire out and reassemble and connect the wires again. 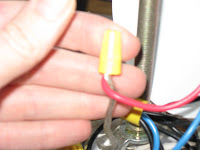 After reattaching the outer casing I add a two pronged plug. Make sure to follow instructions. I bought the wrong plug for the wire I had. I had silver wire and got plugs for brass wire only. Not good, so I went and got the right kind of plug..for silver (aluminum, I think) wire. These are not really instructions. In fact they are more of a proof that I did rewire the lamp. 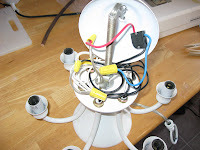 I googled "How to rewire a lamp" and got all the info I needed. I am doing as my mother admonished. Finish!